Maundy Thursday (Holy Thursday) is a service to commemorate Jesus' Last Supper and the beginning of our sacrament, the Lord's Supper. The word Maundy comes from the Latin mandatum, which means "commandment." Maundy Thursday is remembered as the time Jesus ate a final meal together with the men who had followed him for so long, his disciples. At the Last Supper, Jesus gave the disciples a new commandment to love one another as he had loved them (John 13:34-35). Prior to breaking the bread with the disciples, Jesus washed their feet as a sign of servant hood. 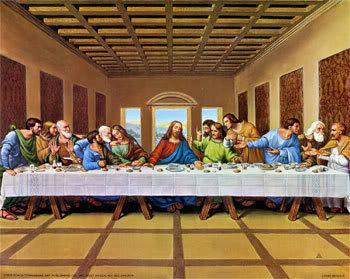 The events of the Last Supper can be read in the Gospels of the New Testament; Matthew 26:17-29, Mark 14:12-25, Luke 22:7-23, John 13:1-20. The Lord’s Supper is also defined in 1 Corinthians 11:7-23. The real center of the story of the Last Supper is the death and resurrection of Jesus. In the elements of Holy Communion we receive, as Luther put it, the real presence of Christ "in, with and under" the bread and the wine. Because Scripture clearly indicates the importance of recognizing the real presence of Christ in the Sacrament, as Lutherans, we stress the importance of understanding this Biblical teaching prior to receiving The Lord's Supper. Even as Jesus and his beloved disciples shared their meal together, they already stood in the shadow of the cross. Later that night, after they had broken bread, as Jesus and His disciples were praying in the Garden of Gethsemane, Jesus was arrested and taken to the Jewish high council at the house of Caiaphas the High Priest. From there he went to Pilate, the Roman governor; then to Herod, a commander of Galilee visiting in Jerusalem; and back to Pilate. On Friday He would die. Maundy Thursday worship services at Zion always include Holy Communion. Usually the confirmands at Zion partake of their first Lord’s Supper with their families. 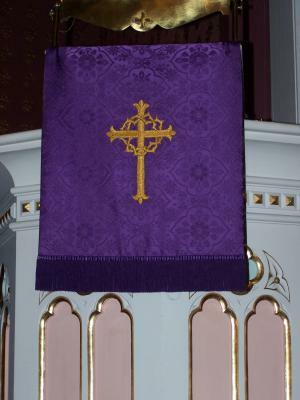 The color for Maundy Thursday is royal purple the same as the color of Lent which has come to represent somberness, solemnity, repentance and prayer.